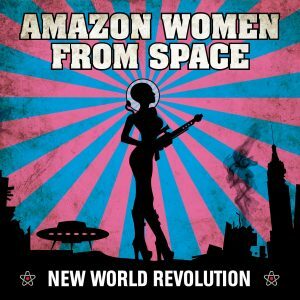 Amazon Women From Space is the new EP from H3rwig Maurer’s New World Revolution is a collection of unreleased tracks dating as far back as 2000, right after the demise of the Mankind Liberation Front. Maurer says that the reason they weren’t released before this is that he “never felt fully aligned with the lyrical content, basically kind embarrassed about some of it” — but fan interest drove him to finally release them while he continues work on the upcoming NWR full-length Operation of the Sun. Honestly, he doesn’t have anything to worry about — whether or not he’s a fan of the lyrics, the music is strong — and something that should make everyone excited for the new LP.The first half the EP is a bit rockier and punkier — songs like the “Explore the Limits” and “Trapped”, feel like a punk band augmented with electronics, though the back half is a bit mellower. “Explore the Limits” has a driving bassline and crunchy guitars with a cool flange effect. I could actually hear this on modern rock radio — and I mean that in the best way. “Amazon Women From Space” is dancier, more like the Mankind Liberation Front than a lot of the New World Revolution stuff. “Trapped” is particularly strong song with its combination of crunch and jangle and lyrics of disillusionment with modern life. It’s songs like this that show how even the stuff the best artists throw away is better than most stuff weaker artists hang on to. (Also known as the “this is a b-side?! !” effect.) “Killing Buddha (Reprise)” follows, and is a much more atmospheric track; one at first listen I thought was instrumental, but then I realized that there were vocals — just mixed in the background to give a subliminal feel. I still can’t really make them out, but I enjoy the sound. The best track is the 30 minute long “The Secrets of Space/Time Travel”, which takes a simple riff, and continually mutates it into a slightly hypnotic yet still interesting marathon, not unlike Kraftwerk’s “Autobahn”. It’s more about texture than wankery – the arrangements and solos are sparse enough (but not too empty) to make it more than masturbation. The song is about itself and how people listen to music and how music evolves and changes yet stays fundamentally the same. Or maybe it’s just a really long song with a cool riff, whichever.